Genomics has the potential to change medicine. In 2003, the Human Genome Project was completed after fully sequencing and mapping the genetic code of a human being. While that project cost $3B, the cost to sequence a gene has fallen precipitously, to approximately ~$1000 today. 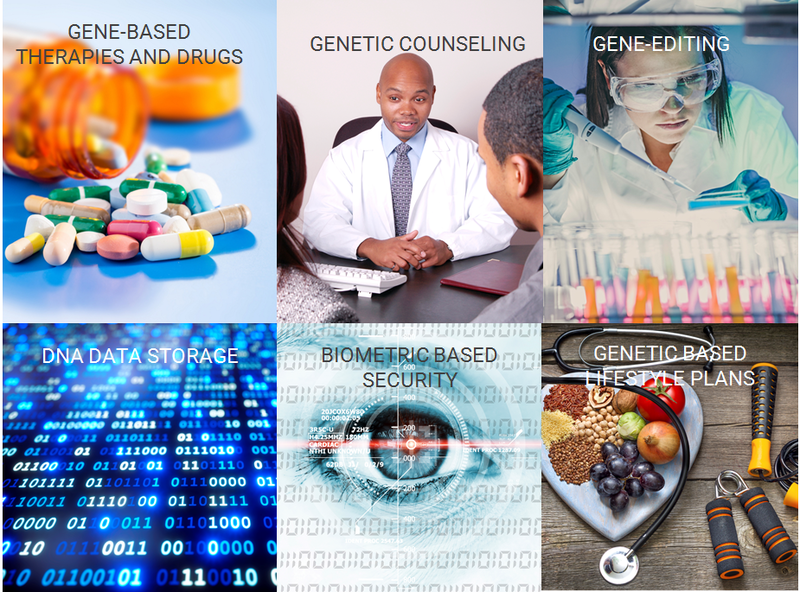 This has caused a dramatic shift in the field of genomics as new business models emerge, technologies develop, startups launch, and genomic data grows. 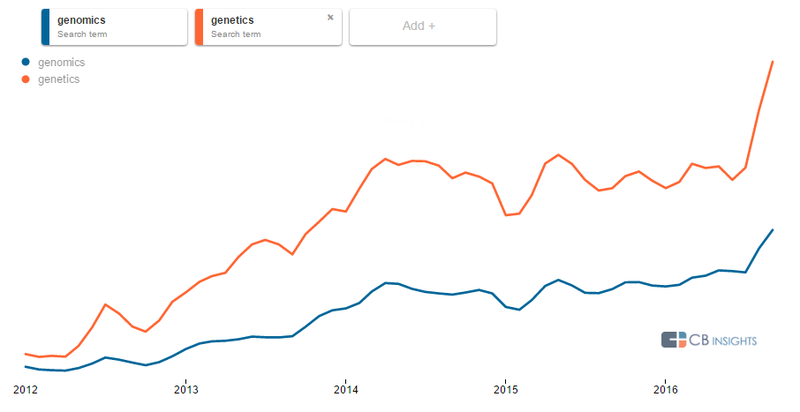 Thanks to this, we’re now seeing more excitement than ever surrounding the use of genetic data (which we mapped using our Trends tool, which analyzes millions of media articles to track emerging trends in innovation and tech). 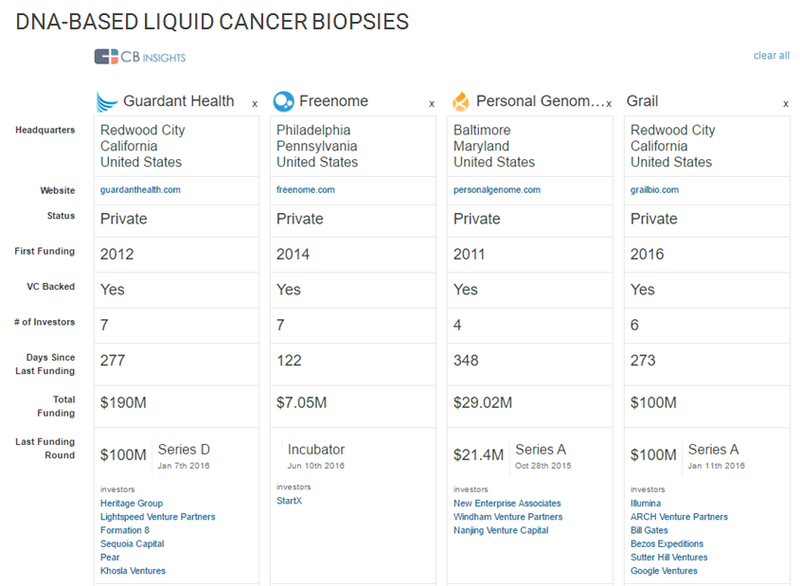 Two frameworks can help us categorize specific genomics companies. The first framework is the genomics “stack,” that is, the steps from collecting the sample to analyzing the data. The first three steps are sample collection, sequencing, and software. After that would be services, which we’ll talk about later. Each of these steps has its own difficulties/advantages: sample collection is difficult to scale but companies in the space can develop stronger consumer relationships, which can help them sell additional offerings; it’s difficult to displace incumbent companies like Illumina in sequencing but doing so provides control over the data; analytics is asset-light but it’s also hard to acquire the necessary training datasets as well as hire top talent at the intersection of biology and computer science. The second framework that’s useful is whether the company is operating to satisfy consumer curiosity or whether its applications have medical relevance. This also presents different issues ranging from regulatory burden to the ticket price of each potential customer. The most nascent area are the companies serving both aims, which I’ve called “Genotype Guided Medicine & Wellness.” This can be expected to develop as the clinical implications of genetics are better understood. Using these two frameworks, it’s possible to start grouping companies together and compare them based on how much of the “stack” they deal with and whether they’re more consumer or medical focused. For example, companies looking at circulating DNA in blood-based diagnostic tests to detect early signs of cancer tend to work across all parts of the stack while focusing on the medically relevant part of the Venn diagram. 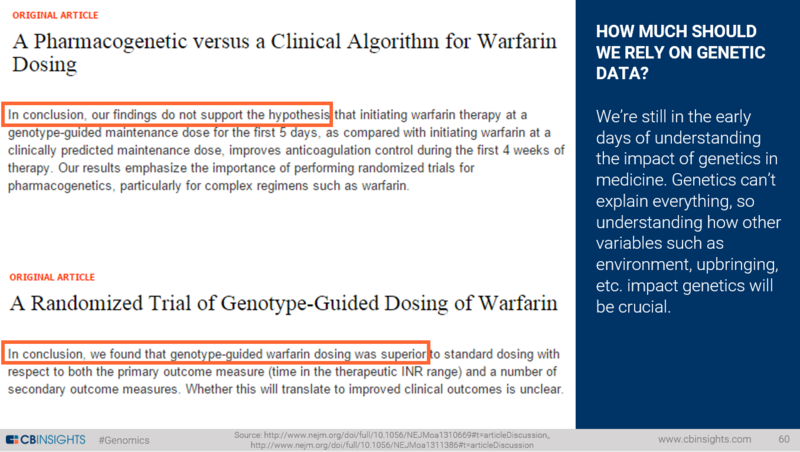 We dove into more of these examples in the webinar. While there’s been a lot of excitement over the potential of genomics, it’s important to remember that we’re still in very early days. When we look at the funding trends in the space, we see that while activity broke 100 deals for the first time in 2015 and we’ve seen three quarters straight of $1B+ in funding, dollars were heavily concentrated into a handful of companies and the fastest growth is happening at the earliest stages. On top of that, what we understand about how genes are expressed is constantly changing. Medical research studies can arrive at one conclusion, while another set of studies arrive at the opposite conclusions later. Building up the amount of genetic data we have is the first step, but understanding how those genes are expressed and interact is still largely unknown, making action on this data difficult. When it comes to all things healthcare, government regulation plays an important part in making sure everything is safe and accurate, genomics included. In the US, one of the tough parts about genomics companies is that different parts of the operation are subject to scrutiny from different government bodies: The Centers for Medicaid & Medicare Services (CMS) for labs, the Food and Drug Administration (FDA) for kits and information, and the Federal Trade Commission (FTC) for marketing. Regulations are constantly being updated now that the area has developed, and companies have to be aware of the new rules as they come up. 23andMe was one of the first companies in the space to sell direct-to-consumer testing and forced the FDA to reevaluate its rules (and subsequently saw the company’s value jump after some of their tests were approved). We can see the FDA impact on the company using our Trends and Enhanced Valuation tools. While regulations are one dimension of government involvement in the space, it also plays an important role in funding projects through grants (as seen in the deal search for “grants” below). The Obama administration’s big push into precision medicine has heavily highlighted genetics as playing a key role, though that policy is in doubt now that a new administration will take over the White House in January. The government is currently building its own genetic database, which importantly aims to have a more diverse dataset since currently companies are limited to sequencing the genomes of those that can afford it. CB Insights is a National Science Foundation-backed companythat uses data to provide VCs, corporate strategy, M&A teamsand business development professionals with intelligence onemerging companies and disruptive technology trends.